Great News from the top for South Mexico! 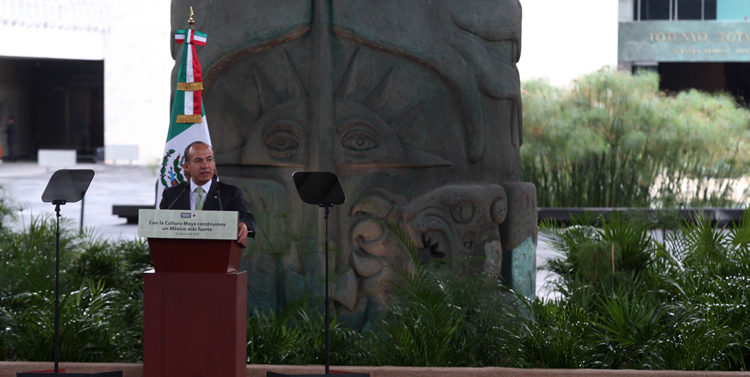 The President of the United Mexican States, Felipe Calderón launched the Mundo Maya, which seeks to strengthen the tourism of our country to increase the number of visitors to Mexico. He said that this program is aimed at tourists from Mexico and the world aware of the Mexican southeast and explore the unique riches offered by this magical region. "We know the huge potential of this area of ​​the country and therefore want to give a new impetus," he said. With the Mundo Maya Mexico will position itself as a tourist destination worldwide. The Secretary of Tourism, Gloria Guevara Manzo said that the tourism program launched by President Felipe Calderón will boost cultural tourism in our country. It is estimated that in the remainder of the year and during 2012, more than 52 million tourists visit this region, which will generate a visitor spend of more than 270 billion pesos. He explained that the December 21, 2012 is a significant date in the account of the Mayan calendar, as this day ends the cycle of 1 million 877 thousand days, which began in 3000 BC 114, so that from this day begins a new era. Therefore, in the states of Campeche, Chiapas, Quintana Roo, Tabasco and Yucatan develop a series of actions to boost tourism in our country. "It's an invitation to mobilize the country and promote cultural tourism as one of our greatest assets. Because tourism is culture and cultural tourism humanizes us, unites us with other regions and sample the best of us. It allows us to strengthen national identity and attachment to our roots, "said the Tourism Secretary. In turn Lujambio Secretary stressed that the education sector support program through a series of actions, including infrastructure improvements of monuments and archaeological sites in the Mayan region of Mexico, example is that through the National Institute of Anthropology and History , will conclude the restoration of the former convent of Santo Domingo in San Cristobal de las Casas, Chiapas, the construction of a tourist in the Ecological Reserve of Calakmul, Campeche, the opening of the archaeological sites of Lagartero and Plan of Ayutla in Chiapas, as well as the Ichkabal, located in Forest Reserve in Quintana Roo Bacalar and opens the Archaeological Museum of Cancun, Quintana Roo. He said that "actions like this, coupled with research and academic debate will encourage the National Council for Culture and the Arts will promote the contributions and legacy of the Mayan culture through some 500 cultural programs Mayan five states in the country, with activities such as exhibitions and seminars, workshops and conferences, festivals, dance, music and theater, including the integration and strengthening of children's and youth orchestras.
" The head of the country's education policy, said that "education and tourism are two sides of same coin, tourism promotes appreciation, knowledge, enjoyment of the places, landscapes, flora, wildlife, cultures, education in turn, provides the tools for civic and ethical tourism activity civilizing cultural activity, a source of income, life-enhancing and regional economies. " 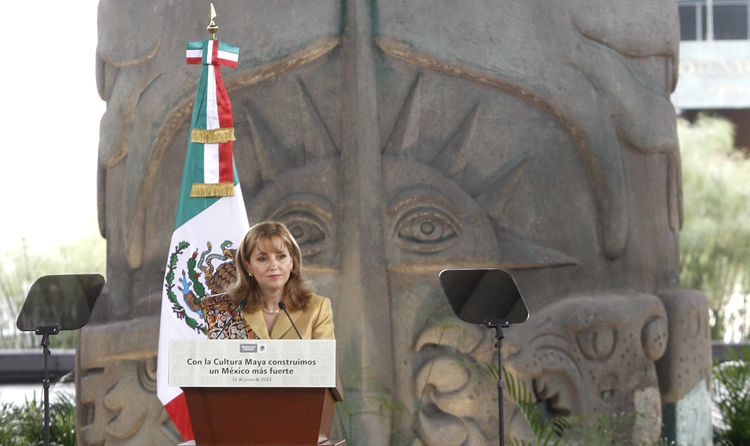 To support this tour, the Governor of Yucatán, Ivonne Ortega Pacheco, will launch the Maya museum of Merida, which will open its doors next year. The museum will be the largest of the Mayan culture and will have an important sign of civilization. The opening of this building will be an important pole of attraction for national and international tourists to know the extent of this civilization. From Punta Cancun, the Governor of Quintana Roo, Roberto Borge Angulo, said the December 21, 2012 begins a new stage. Borge Angulo said the government of Quintana Roo will continue to work to boost visitor arrivals to the archaeological sites of the entity on behalf of our country. He said all service providers will participate in this cultural and historical heritage by providing attractive options for all domestic and foreign visitors to enjoy all the great cultural wealth of Quintana Roo. The Governor of Campeche, Fernando Ortega, who conveyed his message from the archaeological site of Edzna said that the governments of the five Mexican states to work in partnership to encourage the arrival of more tourists to our country. Invited national and foreign tourists traveling on the states that make this area inhabited by the Maya culture that made great contributions to humanity. From the archaeological site of Tonina, the Governor of Chiapas, Juan Sabines Guerrero, thanked the unprecedented support provided by the Federal Government to tourism in order to place our country as the fifth destination nationwide. The state ruler said that the rich biodiversity of our country allowed Mexico was designated to host the World Summit Adventure Tourism, which will take place in San Cristobal de las Casas, Chiapas, from 17 to 20 October. From the archaeological site of Comalcalco, Tabasco Gov. Andres Granier, invited national and foreign tourists to know the natural wealth that has southeastern Mexico. Granier Melo said that Tabasco has important vestiges of the Mayan culture, so they are undoubtedly a great attraction to encourage the arrival of more visitors.